Este artigo é sobre the race. Para the creatures, veja Falmer. 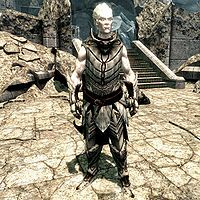 Little is known of the Snow Elf society, other than that it bears parallels with that of the Altmer. They kept in contact with other elven kingdoms. They developed a complex and nearly indecipherable language. Only a few people in Tamriel can even recognize their alphabet, let alone read it, making it an ideal cipher for anyone with the proper knowledge seeking to encode their writings. They developed their own method of telling time, and magnificent architectural achievements, among other things. 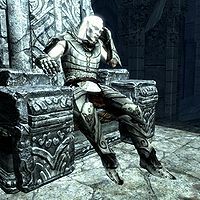 The Altmer and Snow Elf pantheons overlap significantly, possibly entirely: both acknowledge Auri-El as the sovereign and venerate Trinimac, Syrabane, Jephre, and Phynaster. They had temples to all of them, though none were as impressive as their Chantry of Auri-El. Their writings reference "Young Ones" and "Old Ones", though how precise this distinction is and its significance in their society is unknown. 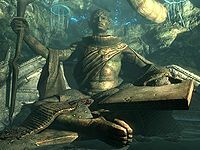 Ancient Scrolls of the Dwemer VIII de Marobar Sul — Book 8 of a series of fictional stories about the Dwemer. ^ a b c Athellor's dialogue in Bloodmoon. ^ a b c d e f g h i j k l m Gelebor's dialogue in Skyrim. ^ Brynjolf's dialogue in Skyrim. ^ a b Enthir's dialogue in Skyrim. ^ Dialogue of Skaal villagers in Bloodmoon. ^ Vyrthur's dialogue in Dawnguard. Esta página foi modificada pela última vez à(s) 19h13min de 11 de março de 2018.